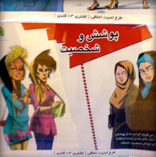 A poster campaign, "It's our own fault", promoting good hejab in Iran. A lot of changes have been taking place in Iran over the last week, the Islamic Republic has been remembering itself, taking further steps than enforcement of the dress laws. Coffee shops have been closing due to women smoking in them, clothing shops will have to have their stock put to the scrutiny of the Islamic ideals and Satellite dishes have been torn from roofs. I occasionally duplicate my blog at an interesting site by the name of MidEastYouth.com, a site that brings folk from the Middle East together to share and publish words and ideas. I'm flattered that they except me as a youth and often enjoy the lively debates that spin off from mine and other people's writing. 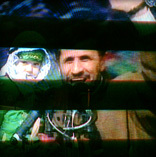 Occasionally I get lost in these debates and felt that one of the recent ones resulting from an article concerning the struggle for free press in iran [oddly enough this has now been deleted by the author who feared the repercussions, or so I was told], would be a timely one to reverse-post with. Here is my last response/rant. Esra [site founder], I feel you've rather missed the point about Chomsky (with all due respect). The beauty with Chomsky is that he doesn't have ideas, or at least not in that way. You will often hear him state that he is far too unqualified to make predictions and you will note that he's at pains to simply present facts and make suggestions as to other ways to perceive them. It is by not sticking his neck out like this that I feel he gets a large audience and relatively little bashing. That Chomsky 'doesn't try hard enough' [referring to Esra's comment] to enforce any ideas might make sense with what I say above. Although it should be added that Chomsky was very active in his early years as far as protesting and organising. As for Chomsky not being a force for change [referring to Esra's comment], I very much disagree here. When the people have access to such a wealth of mostly hidden facts, then has them presented in a way that exposes alternative agendas - I feel this is a very powerful source of change. he has been a huge influence for me, a true intellectual power-house with such a perfect form of presentation, modest, selfless and relentless. He has inspired me to dig deeper, try harder and alway reflect upon my bias. Which leads me on to City boy [the author of the article in question], maybe I need to be clearer here [referring to his response to mine]. Yes, we can be reductionist about bias and suggest that all individuals include an amount of prejudice in their words, actions and behavior, this should be universally appreciated. But we must look at the bias in the institutions and corporations. To get back to Chomsky, he asks us to consider that the media's market is the advertisers and their product is the consumers - with a bias toward more wealthy consumers. With this in mind we have our understanding as to the trail of influence. Jina [commenting on City boy] suggests that Fox news is a mirror for the government, yet I feel this also misses the point, again, Chomsky would tell us that the Government is the shadow created by the corporations, and especially so in the USA I would add. Regardless, the media simply align themselves to the market thus adapting what we consume. Where this is slightly different is in cases like the BBC, whereby license payers contribute with the government to provide a service. Yet I see this as a more interesting form of media distribution of which is certainly still open to bias. One may simply read of BBC Persia's reporting during 1953 when Mosadegh lost power. More amusingly the BBC did a documentary about it recently. But one sees these cases where the consumer is fed to fulfill the needs of the government and those higher up: the corporations. Was it no small coincidence that the largest company of the that period ('53 coup) for Britain was British Petroleum which pretty much functioned only in Iran. City boy, aziz e delam [returning his Farsi endearment], please do not purport to be a tour guide for 'reality'. "Freedom of democracy" is an illusion for a few countries and although I have also heard our dear Chomsky suggest that indulging the political process has benefits, he is never a faithful for the concept and neither am I. The farce of a system that we have in those countries (that feel so enlightened to export such a virtue) is simply a means to control the masses. The field may be larger, the fence maybe lower but we are still sheep to use the metaphor. My guess is that soon the fence won't even be needed as we will simply obey. But you know my field is different with methods such as these [blogging] although my basement [term used by City boy] doesn't have the resources to compete with the majority of the established media. Yet it is not the resources I desire as this will then create a market and thus I am no different. So OK, as you suggest I can write for these institutions and corporations [in my basement as is suggested], but you honestly think I am at liberty to say what I will. But then we can get on to systemic failings, which I might state is where America struggles more. Robert Fisk talks occasionally about this subject whereby career mindedness or even the need to maintain a job has sucked the life out of any ability to counter the corporate line. So we can sees the compounding distortions. But yes City boy, there is a difference between Iran and the 'West', but this difference is – in my mind – to do with the ruling family or party's strength. The 'West' is afforded 'freedom' and 'democracy' as the results are not as harmful or at least comfortably undermined. In nations like Iran, the clamping down is a reflection of the weakness in dealing with it by other means. But City boy, I don't much care for revolutions [he suggests we should conspire to one] nor think it would be wise, I might rather evolution - it's less bloody among other things. Regardless, optimist or pessimist, keep on writing and thinking, moving and progressing. Watch that 'q' change to an 'n'. "So back over to Tehran. Tell us, would you say that your writing would be different if you were sitting in London? ", came the voice on my mobile as I paced the cold echoing hallway having nipped out from the Latin beat and salsa of a Thursday night gathering. I wondered if my anonymity was a good enough example while conducting the cosy conference call of three – plus the few hundred thousand tuning in maybe. A friend then opened the door to see where I'd gone, "Daveed? ", they shouted. Damn that echo. "Yes", was my simple answer before elaborating further, "but it's not necessarily the establishment I adapt for, I worry about antagonising with the people and their culture". I've pondered this matter for a while now and am amused at how my 'freedom of speech' is not restrained by a well placed few, but maybe by the ideology of the mass – it's chickens and eggs though. "But there are ways to present things to... you know? ", I semi-smugly added in conclusion. Also on the BBC I see much the same thing but from the other end. As the homepage repeats 'Iran' (watch that 'q' change) with greater frequency I've taken to visiting its 'Have Your Say' public comments section, a forum for all manner of sqitted mush. Of late there's been a few of the, "How should the world deal with Iran? ", "What now for Iran?" and a "Here's a neutral question about Iran, how on earth can you say it's anti-American?". "45-minutes away, Yellow Cake, Alooominum toobs, satellite images – do they think we're stoopid?" I use these features as a measure of sorts, a measure of how much stronger the Americans are at the game. Oddly enough when 'Have Your Say' first appeared it was the measuring point that frustrated me. As the entries are monitored and were previously measured before posting, we witnessed a for, against, for against series and no indication as to what the mood was. "There are surely some matters that clearly get a weight one particular way? ", I wrote to the Head of News around the time, indicating that maybe their tweaking distorts the picture. You might for example have had 8-displayed responses to, "45-minutes away, Yellow Cake, Alooominum toobs, satellite images – do they think we're stoopid?". Four of these responses might say, "let's blow those sand monkeys further down the evolutionary ladder", and four-hundred could have said, "read the receipts!". "Another question set up so this "Have Your Say" can become a US-bashing forum. Why should we fear Iran having nuclear weapons? Because they are a fundamentatlist, theocratic state which severly curtails freedoms and human rights. The US, on the other hand, is still a bastion of freedom and human rights despite what is highlighted by the foriegn press. Which do you fear?" "The world should do nothing about Iran. Iran is a sovereign nation and it is entitled to have nuclear power consumption. Just because the USA is war-mongering doesn't mean the world has to listen to their made up lies. The country the world should fear is America! Their government is crazy!"